The Orange Crush is a bike you don't want to mess with. It's loved and revered, with award winning performance, it's the definitive aluminium hardtail. So for 2018, with the exception of a push to 148 boost spacing and a slight reshape of the stays to allow big volume tyre fans to satisfy their cravings, we've left it well alone. The geometry is bang on point, the rear triangle features a bolt-through axle, giving unparalled stability to what is already a rigid design. The confident handling 65° head angle along with the Orange Crush's long top tube design that adds an extra few millimetres means, size for size, a 50mm stem puts the rider right where they need to be for direct input and weight distribution. Short chainstays make climbing as sweet as ever for a long forked hardtail, those stays now reshaped to allow clearance for a more than chunky 2.6 tyre. 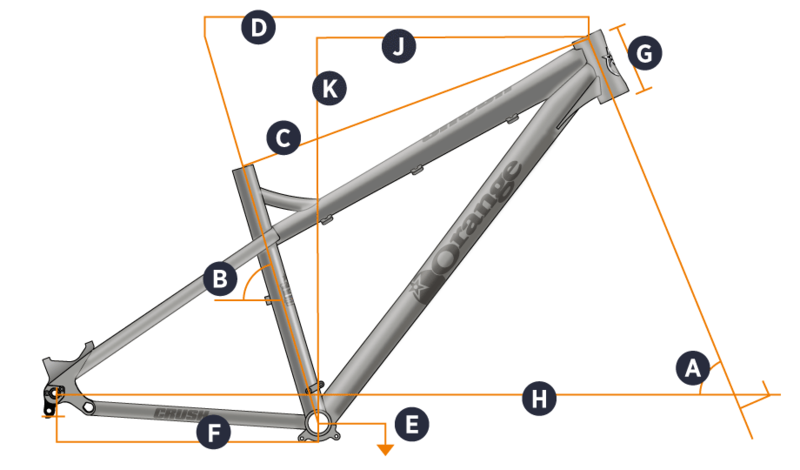 Sunset Cycles offers the 2018 Orange Crush 27.5 hardtail mountain bike frame with up to 24 months 0% finance and free delivery.